This is a bottle of sparkling wine. Not Champagne. It is only Champagne if it is from the Champagne region in France, and the grapes for this wine were grown in Sonoma County. However, it was produced méthode champenoise – not just carbonated. This means… millions of tiny bubbles in the glass! 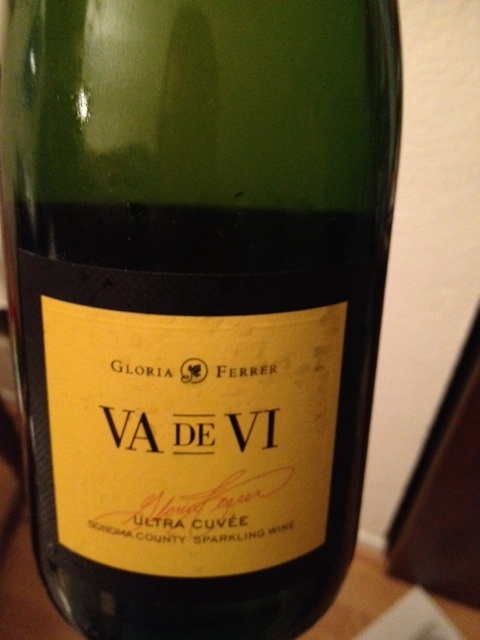 If you enjoy very dry sparkling wines, pass on this one. However, if you enjoy a wine that starts of sweet but finishes tangy, try Va De Vi. It is mostly Pinot Noir and Chardonnay, with a little Muscat blended in. I smelled lots of apple, but it tasted more like pear and peach. As soon as you sip, you can taste a hint of that sweet muscat. But not for long… the mouthfeel has lots of pear and sour apple, and the finish was a little creamy with nice acidity. Pairing: creamy cheeses. Or very enjoyable on its own. This wine definitely has substance, and is great for the price. Budget special occasion bubbly… I feel it has more character than Veuve Clicquot Yellow Label, and costs less. If it came in half bottles, I would be in trouble.